Many veterans are not aware of resources in their communities to help with transitioning to civilian life. CHICOPEE, Mass. (WWLP) – There are over a million people currently serving in the United States military, including reservists. There are millions more since World War 2 that have retired or been discharged.Some of these brave men and women have experienced conditions most of us could never imagine. Homelessness, unemployment, Post Traumatic Stress, addiction and suicide are some of the most pressing issues veterans face when returning home from deployment or leaving the military. An essential part of helping veterans transition to civilian life involves their home communities, and connections to local outreach programs. Christian DiLuzio, Employment and Training Specialist at Veterans, Inc.
Michael Hagmaier, Senior Vice President of Soldier On. If you or someone you know is serving in the military or is a veteran in need of support services, most cities and towns provide a Veterans Service Officer who can help you connect to benefits and programs within your community. Below are links and contacts to help you get started. Nick Marrocco, a 62-year-old recovering heroin addict, helps arrivals adjust to Soldier On in Northampton’s Leeds neighborhood. 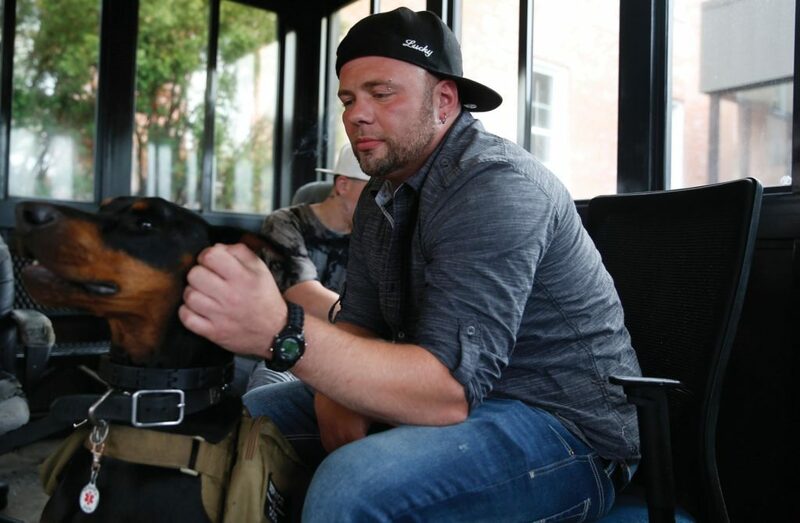 NORTHAMPTON — Army veteran Mark Pritchard, a recovering heroin addict, failed two drug tests early in his 15 months at the Soldier On residential program for homeless veterans here. Each failed test sent him back to prison for a short time. And each return to Soldier On, he said, brought him close again to easily available heroin both on and off the grounds. “If you want it, you can get it,” the 44-year-old veteran said of the hilltop campus, where a US Veterans Affairs medical center also is located. State per-capita data released in 2016 laid bare the consequences: The Northampton neighborhood of Leeds, where Soldier On is based, ranked sixth for opioid-related hospital visits among Massachusetts ZIP codes with 1,000 or more residents, according to the state Health Policy Commission. Five veterans at Soldier On have died from opioid overdoses over the past three years, staff members said. And police have traced some drug-related crimes in Northampton, such as breaking and entering, to its clients. But the organization is credited by law enforcement and social workers with working hard — and out of the box — to help men and women who have not fared well in traditional rehabilitation programs. It’s an unorthodox, regulation-averse, and relatively independent life for Soldier On veterans who use 210 transitional and permanent beds in Leeds. The organization also has a total of 82 units of permanent housing in Pittsfield and Chicopee, and 51 more are planned for Agawam in August. Despite the persistent temptations, Pritchard and other veterans called Soldier On the best chance they have had to reclaim their lost lives. James Torrey said he avoided added jail time in exchange for a supervised regimen in which he is given access to treatment. There are no surveillance cameras at Soldier On, which is a nonprofit organization that is separate from the VA facility. There also are no scheduled drug tests, and residents can come and go until a midnight curfew. Even some of the scheduled medications for veterans are distributed by fellow addicts and alcoholics. A wide range of services are available, from groups such as Alcoholics Anonymous and Narcotics Anonymous, to mental-health services, relapse support, and spirituality meetings. Narcan, a drug that reverses overdoses, is available in the bathrooms. “They don’t kick you to the curb,” said Nick Marrocco, a 62-year-old recovering heroin addict who helps new arrivals adjust to Soldier On. However, the path to the dark side is never far away. 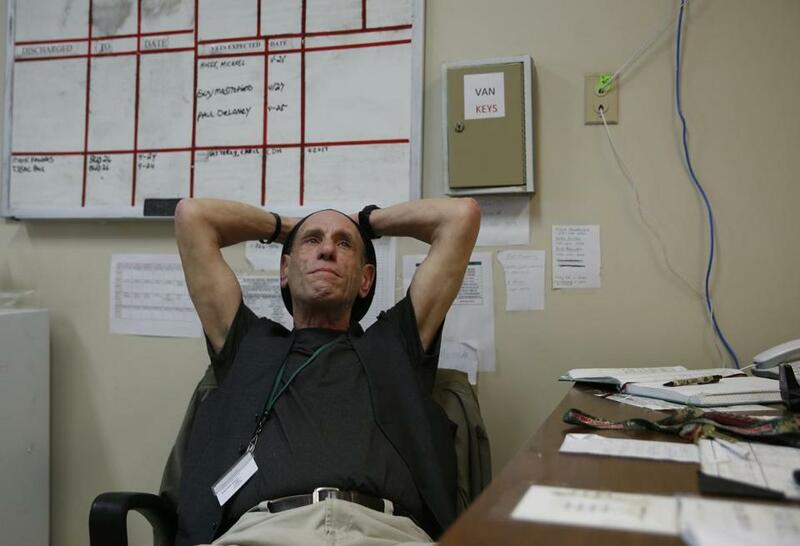 “On the first day I worked here, two people died in Building 26,” said Mike McMahon, a longtime correction officer who oversees day-to-day operations at Soldier On. Marrocco counted three relapses among clients at Soldier On in the past few weeks: two from opioids, one from cocaine. Jack Downing, the president of Soldier On, said the availability of illegal opioids is part of the sinister, real-world challenges the organization readily confronts — with toughness when needed, but always with compassion. Rooms are searched when illegal drug use is suspected, staff said. Clients can be ordered to leave the program, but such decisions are made reluctantly and only when the veteran becomes a clear threat to the Soldier On community, said John Crane, the director of case management. Expulsion can bring the same perils without the benefit of residential support. Northampton is a short ride from drug hubs in Holyoke and Springfield, and it is easily accessible to Interstate 91, a major north-south corridor of the heroin trade. On April 29, Northampton police issued a public-health alert after responding to six non-fatal overdoses in 24 hours, including five from heroin. That alert followed an alarming surge last year, when Northampton police responded to 44 heroin overdoses, including six fatalities. The previous year, police responded to 15 heroin overdoses and no deaths. Officials at the VA medical center, which has 60 inpatient psychiatric beds, said they did not have overdose data immediately available. “At any given time, a veteran who struggles with addiction may occupy one of these beds,” said Andre Bowser, a spokesman for the facility, formally called the VA Central Western Massachusetts Healthcare System. Liz Whynott, a Northampton native who oversees the Tapestry Health needle-exchange program in Western Massachusetts, said the city of 28,000 people has long grappled with heroin use. But the surge in recent years of heroin laced with fentanyl, a powerful additive, has made the problem more alarming and deadly. Whynott said Soldier On has welcomed Tapestry’s efforts to provide it with Narcan, and that the group has been receptive to education services. “Soldier On is amazing,” Whynott said. Iraq veteran James Torrey echoed that sentiment. Torrey fought with the Marines at the bloody battle of Fallujah in 2004, and later fought a more protracted battle with opioids when he returned home. About two months ago, Torrey cobbled together $3,500 to bail himself out of jail after being arrested for renting out foreclosed properties to underwrite his heroin habit. Once Torrey left jail, the 30-year-old went directly to Soldier On. Later that day, Torrey donned a nice shirt and tie for his weekly appearance at the veterans treatment court in Holyoke. By volunteering for the 18-month program, Torrey said he avoided additional jail time in exchange for a supervised regimen in which he is given access to treatment, counseled by a mentor who also is a veteran, and tested for drugs. Torrey told Judge Laurie MacLeod that he is progressing well. He expects to get a union carpenter’s job soon, and Torrey added with a broad smile that he planned to go skydiving in a few days. “I get bored easily, and that might have been one of the reasons I went back to drugs,” Torrey said. For now, Torrey is on a better path, although the journey remains pocked with potholes. Torrey’s mentor, Vietnam veteran Alan Robbins, commended him for taking pride in his appearance. 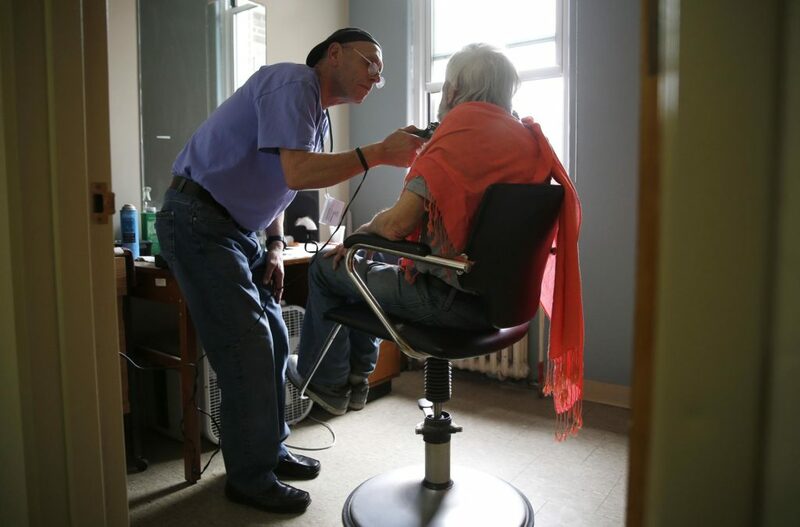 Marrocco gave a haircut to a fellow veteran at Soldier On.